Our theme is “Mountain Comfort”… a home-away-from-home with upgraded finishes, features, furnishings and amenities throughout. The split-level design offers five spacious bedrooms, each with a full bath, and ample privacy. The upper level includes an open kitchen and dining area with access to both the living room and the private deck where our six-person hot-tub overlooks Main Street Park City. The lay-out is ideal for family gatherings and socializing with friends. The kitchen is equipped and well stocked including a spice/staples cupboard. Additional features include covered parking, outdoor ski locker, indoor boot dryer, gas fireplace, Bose sound system, cable tv, wifi, water softening system, whole house humidifier, baseboard heating, and air conditioning (a real treat in the summertime). 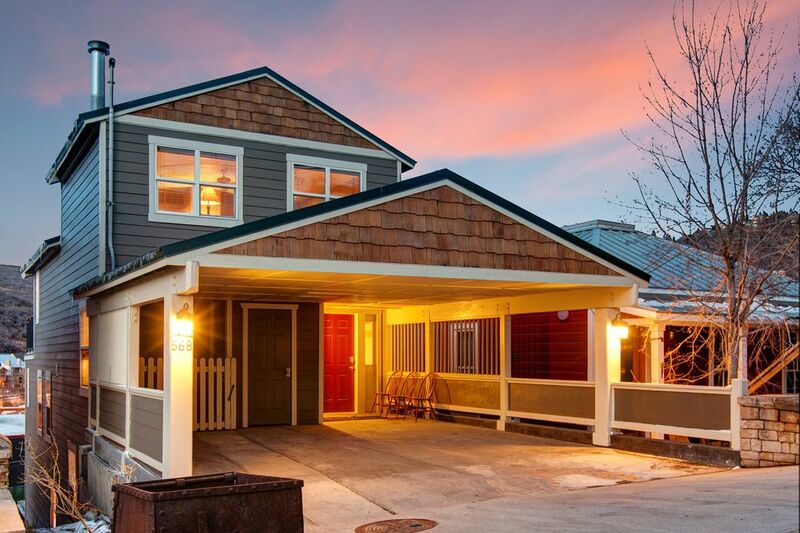 Olcha House is located on upper Woodside Avenue, one of the most desirable addresses in Park City's historic Old Town, with convenient access to the Town Lift, Main Street, and the free shuttle. Our ideal location meets everyone's needs and eliminates the logistic hassles. Staircases on either side of the house lead to the center of Main Street... great dining, entertainment, and shopping right at your doorstep. The Pedestrian/Ski Access Trail to the PCMR Town Lift is just steps away. If you choose to walk to the lift it's an easy 4-5 minute downhill walk. Intermediate skiers can ski-in for lunch or at day's end via the Town Runs (Quit'n Time and Creole) and download across the street from Olcha House. If you’d like to spend the day at Deer Valley the free shuttle is conveniently located at the end of our street. For those who want to venture out… Alta and Snowbird ski areas are just a 45 minute drive. PARK CITY RESORT… NOW THE LARGEST IN THE U.S. !! Vail Corporation recently acquired Park City Mountain Resort and installed an eight-passenger, high-speed gondola running from the base of the Silverlode Lift to the Flatiron Lift at the Canyons creating the largest resort in the United States with over 7,300 acres of skiable terrain. ABOUT OLCHA PROPERTY MANAGEMENT... Our family purchased this home in 1997 and named it "OLCHA HOUSE" in memory of the family matriarch, Olcha Van Dresser, who passed away a few years prior at the age of 103. We instantly felt at home and PC quickly became our favorite place to ski in North America. Having spent over 25 years in the travel industry, it was a natural transition for me to assume the responsibility of managing and marketing our home. Over the past few years I have selectively expanded to include an elite collection of homes in the Park City - Deer Valley communities. Olcha Property Management is a boutique property management focused on delivering an "Exceptional Experience Beyond Expectations" for both the property owner and our guests. WE'RE HERE TO HELP.... Take the perfect accommodations, add the grandeur of the Wasatch Mountains, two of the country's premier ski resorts, and the charm of historic Park City.... and you have a vacation like no other. To further enhance your visit we offer Concierge Services for those who desire added comfort and convenience such as private transportation, grocery stocking, in-home equipment fitting / delivery, in-home chef / catering, and special event planning. Ski-in via Town Runs (Quit-n-Time and Creole). Download across the street from house. Short walk to Ski Access trail leading to the Town Lift. Central Air - A real bonus in the Summer months! Plus whole-house humidifier and additional potable units in each bedroom. We provide staples...paper towels, dinner napkins, coffee filters, dish soap, and a well-stocked pantry including sugar, flour, seasonings/spices, etc. PRIVATE! Highest deck in the area overlooking Park Ave and Main St. Custom Ski-boot dryer in Foyer. The house was perfect for our family celebration. Fabulous location, great layout. Very well equipped and organized. Would highly recommend! Perfect location for a family ski trip in Park City ! The Olcha House was the perfect spot for our large family group (7 people). The unit sits 50 yards from access to Town Lift and makes starting and ending the day on the slopes a breeze, The home is comfortable, cozy and well appointed (the beds are super comfortable). The newly remodeled kitchen is the center of the home and perfect place for cooking, hanging out and taking in the view of Park City. The kitchen has everything you need for large family meals and if not, the restaurants on Main Street are just short walk down a long flight of steps. There is also a large family sized hot tub with a great view of the city. Additionally, there are two covered parking spots, an outdoor ski closet and indoor boot dryer to make skiing that much more convenient. Overall all a perfect place to stay, we highly recommend it. This house is perfect for ski get away. Large enough for families and conveniently located. The house is well appointed for all your needs. Great memories await! Home is located in downtown Park City. It was easy (except for icy streets) to get from house to town, shuttles and Park City Resort Town Lift. Home was comfortable and warm. It was a great place to stay with our entire family of 10 adults. We would definitely visit again. We had a wonderful time at Olcha House! We loved the house. It was in a great location and had everything we needed for a wonderful stay. The view was fantastic and the hot tub welcome at the end of the ski day. We wish we had known that a 10 passenger van couldn’t make it up the hill after it snows! We took the van back to SLC and exchanged it for two all wheel drive Durangos then we had no problem. We could have skied in but we had little ones with us so we needed to drive them to ski school. A couple of us skied to the house one day. We feel like one needs to be able to handle harder blues to ski in. It was easy to walk to restaurants in the downtown area if one is able to navigate stairs and in fact that is important for the house as well since it is 5 levels. The house is beautifully appointed with comfortable furniture and a wonderful kitchen/dining area. We would absolutely recommend a stay at Olcha House! We had a great stay at Olcha house over Christmas. The house had plenty of room for all 9 of us (2 families with 5 kids). The house is very nice and well taken care of. Jodi was very helpful prior to our trip and her local managers were very responsive. There wasn't enough snow yet in the season for the town runs to the house to be open so we tried downloading on the town lift at the end of the first day. That download turned out to be painfully slow so we ended up driving or ubering from the Park City base most days, both of which were easy to do. We tried the bus a couple of times from both from Park City & the Canyons too but the walk up to the house from the bus stop was a bit much with all the ski gear. Location was great for going out for dinner with a quick walk down the hill taking us right to the heart of Main Street.